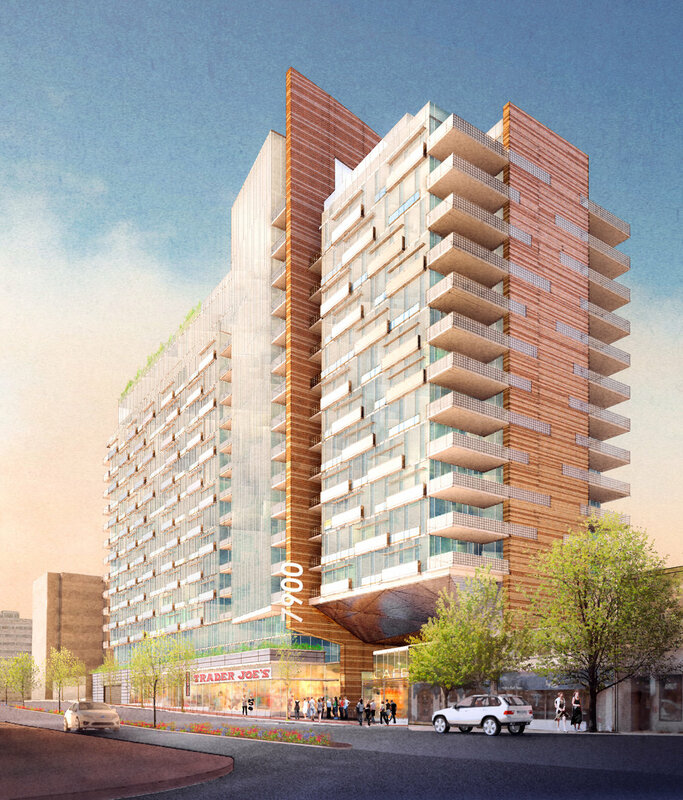 7900 Wisconsin Avenue is a proposed apartment tower located near a Washington Metro Station in downtown Bethesda, Maryland. This dynamic, nearly one-point perspective highlights the three main features of the project: the plaza green, the "bridge" and the large curving brick-clad form carving through the site. The balconies and glazing are treated very loosely, hinting at transparency without committing to specific detail. Deep greens are used to imply rooftop planting both at the podium and upper rooftops. Vibrancy and contrast are punched up at the retail ground plane, and the sky is a deep blue creating a strong contrast with the orange brick silhouette. A bright, sunny view of the Wisconsin Avenue frontage. Closeup view from east of the new grocery store, cafe, and reflective "bridge" feature.